I just got this really great remote dog training collar from Cujo Control. This is a really nice set! It’s well worth the expense. You get one collar that is adjustable. It has holes all along it, so no matter what size your dog is you can fit it to their size and then cut off the extra. Or you can take off the transmitter and put it on your dogs current collar. You also get the remote that you can use to administer the training tools (beeps and shocks). These can be used to decrease a number of bad behaviors. I like the beeps options but it does provide variable shocks as well. 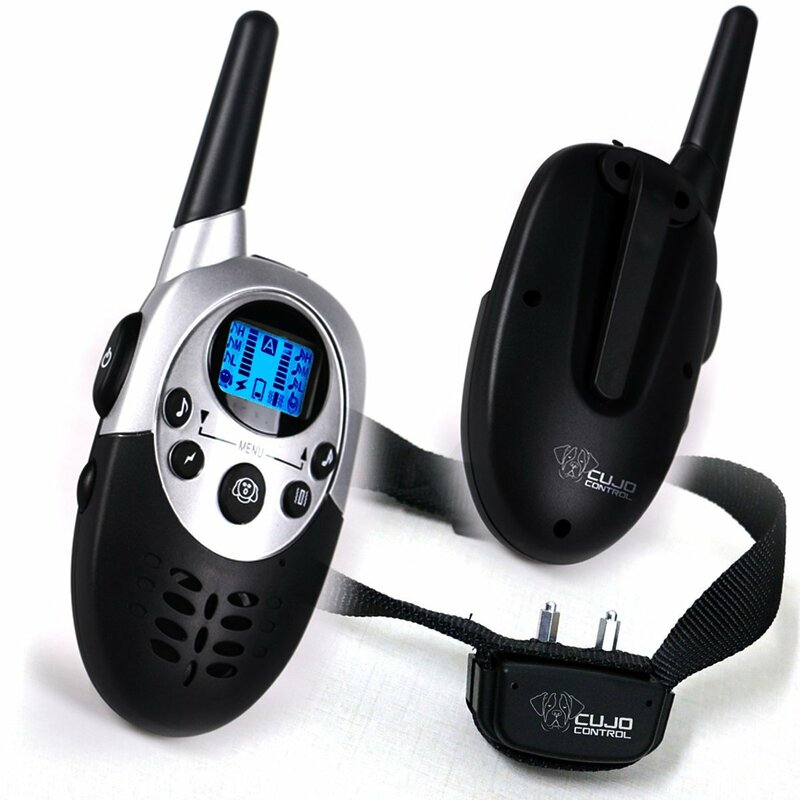 You can customize the tools to your desired level for your pet and you can even link up to two collars to this one remote and provide a unique setting for each pet. We have four dogs so this is perfect for us so we can use this with all of our dogs (we mainly just use it with the two puppies). It helps reduce barking, biting, chewing, any negative behavior really. By simply using an operate conditioning technique you can train the dog to stop a behavior in response to a negative trigger (a bell or a shock). The beep is very quiet but the dog can hear it just fine. It’s enough to get their attention for sure and get them to stop the current behavior. The shocks can be used the same way. You can change the intensity of shocks and customize it to your liking. Setting it up is really easy, there is a manual that explains it all. You will need to charge the remote and collar transmitter using the included charger. Then follow the steps to set up the remote. We have been using the beeps on our pets and it has greatly reduced their chewing and barking behaviors. It’s a wonderful set up! HAVE COMPLETE CONTROL OF YOUR DOG. Sidetracked by squirrels, cats, dogs, or cars and vehicles? With our dog training collar, your dog will respond to you and come to you the first time using this electronic dog collar despite all other distractions. One call and they’ll be there, right by your side. Best dog correction collar for your best friend. MOST DOGS CAN DO A COMPLETE 180 and change within just days using shock collar training, sometimes with just one click of the button. You don’t need to spend hundreds of dollars on obedience training, but your friends will think you’re the real dog whisperer simply by training with our adjustable dog training collar. DON’T BE A PRISONER IN YOUR OWN HOME. With this dog e-collar you can cure any biting, jumping of your dog, barking, and chewing so that everyone is happy in your home. Don’t be ashamed – use your remote dog training collar so that friends and guests will actually want to come over now that your dog is well behaved and fully trained. BE A HERO AND SAVE YOUR DOG’S LIFE. Not only is using a dog shock collar a safe, responsible, humane way to train your dog, but you can prevent him from running across the street or getting into trouble with other animals, saving his life and saving your sanity. It’s okay to keep your dog safe with a shock collar. WHEN YOU ORDER YOUR CUJO CONTROL DOG TRAINING COLLAR TODAY, you’re protected by a lifetime, no questions asked money back guarantee and world class customer service! You can purchase this collar on Amazon!